Revive Your Garments - Easily remove fabric fluff, lint and bobbles from all types of garments and fabrics, including sweaters, jerseys, blankets, bed sheets, upholstery and much more. Quick and Efficient - The expanded blade surface covers a larger area, finishing the job quickly with less effort. Highly Adjustable - 3 shave heights, 2 speeds and 3 shaving head hole sizes for suiting all different types of fabric and bobble sizes. Dual Protection - The adjustable height spacer protects both garments from being cut or snagged and also hands from accidentally touching the shaver foil. 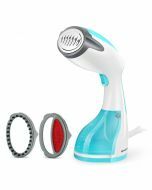 What You Receive - Beautural Lint Shaver, cleaning brush, protective cap, instruction manual, 30-day full refund, and 12-month warranty with friendly customer service. Hate when your favorite clothes or household furniture and linens look old and worn due to excessive lint and bobbles? Keep all your clothes and fabrics looking like new with Beautural Portable Fabric Shaver. 1. Ideal for safely shaving off lint and bobbles from a variety of fabrics. Includes wool products, linens, furniture, and all types of clothes. 2. Powered by 2 AA batteries so you can take it wherever you go. 3. Adjustable to suit all different fabric surfaces. Three adjustable shave heights and two speed options. 4. Extra large cutting head allows for quick and easy removal of fuzz. Here at Beautural, we stand by our products 100% with 30-day full refund and 12-month warranty. A happy purchasing experience is our #1 priority and we will happily send you a replacement fabric shaver if any issues arise. Note: Please place a garment on a flat surface when using the fabric shaver and make sure the surface has no wrinkles as this may cause damage. Batteries (2 x AA) are not included. Has anyone used on cashmere? No, but it seems to be gentle on most fabrics, I would suggest trying on inconspicuous area first. Does this fabric shaver ever snag or cut your fabric? No, but you'd better place your fabric flat when shaving it. Does this fabric shaver work on thin knits and t-shirts? Yes, just lay them flat and go over them lightly. Can this fabric shaver be used on cashmere? Yes, it is suitable for all types of clothing. What size batteries are required for the shaver? Two AA batteries are required. We have a fabric sofa which has bobbled. Would this be safe to use on it? Yes, it would be safe to use the shaver. If you have a big sofa, you may take a little more time to finish it.